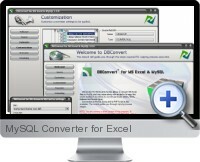 MySQL Converter for Excel (DBConvert) is an application to convert, import or migrate data reliably between MySQL databases and Microsoft Excel in both directions. The bidirectional conversion can be any combination between MySQL databases, MySQL dumps, PHP scripts and Excel files or ranges. MySQL Converter for Excel includes a wide range of features to optimize reliability and performance of data migration, avoid errors and assist with complex source data selection. Integrated data selector allows selection of date ranges and automatic selection to recognize tables for conversion. Ability to apply entire MySQL database or selected tables and fields, indexes and foreign keys to proceed. Configure detailed conversion processes through the step by step wizard or launch conversion through the command line. Database integrity is maintained by supporting all MySQL data types (including BLOBs, ENUMs and SETs) and migrating primary keys, indexes and foreign keys. High speed data conversion and performance via reliable direct connections to source and destination databases. Verifies possible conversion errors and table object problems before the conversion process starts. Ability to define conditional data filters for the migration process. Includes solutions for firewalls and access rights through PHP access and FTP. Full Unicode architecture support with multiple byte character sets support including LATIN1, LATIN2, LATIN5, LATIN7, ARMSCII8, ASCII, CP1250, CP1251, CP1256, CP1257, CP850, CP852, CP866, DEC8, GEOSTD8, GREEK, HEBREW, HP8, KEYBCS2, KOI8R, KOI8U, MACCE, MACROMAN, SWE7, TIS620 and UTF8. Saves session information for destination, source and conversion customizations. Flexible scheduling of conversion tasks with ability to schedule execution of batch files. Option to replace symbols in names of tables and fields (such as symbols reserved for DBMS internal purposes) with a substitute symbol. Ability to select ISAM, MYISAM, HEAP, InnoDB or BDB table types when copying data to MySQL or MySQL Dump. MySQL tables can be converted into different Excel worksheets. User friendly interface with complex conversion options broken down into manageable steps and detailed documentation.